I tried to use TexText in Inkscape 0.48 with Windows XP and was not able to run it. I used the instructions from the TexText side for Inkscape 0.46 because for later versions no insructions are available. I have done the following steps (WinXP): Install Pstoedit 350 (Ghostscript was already installed before) Set Environment Variabel in Windows (starting pdflatex from MikTex folder and PStoedit was successfull) Install TexText 0.4.4 Try to run TexText in Inkscape failed getting the error message shown abowe. But the tkinter error does not want to go away. I'm using windows. The reason seems to be that Inkscape 0.48 brings its own python with it, which is shipped without tkinter. I did not find any way of telling Inkscape to use the c:\python26... Nor how to install tkinter in the inkscape python. Its not really textext's fault. This is very dirty fix, though. I have the exact same two problems when running textext in inkscape: 1)Hashlib error and 2)Neither pygtk nor Tkinter is available! Both of your solutions have worked for me. Thanks for posting! As did you, I copied my entire c:\pthon26 directory into the python directory in the inkscape folder. Now textext works without any warnings or errors. Seems like there must be an easy fix to replace this "dirty fix", but I don't have the expertise to figure it out. I have the same problem (windows xp). Installed Inkscape 0.48, install textext and it doesn't work. I can solve the hashlib problem following pascalschulthes link, but copying another python does not help. Now the message always "The fantastic lxml wrapper for libxml2 is required by inkex.py and therefore this extension. Please download and install the latest version from http://cheeseshop.python.org/pypi/lxml/, or install it through your package manager by a command like: sudo apt-get install python-lxml"
Inkscape 0.47 did not show this behavior, just install 0.47, install textext and it works. For the time being, I uninstalled o.48, then reinstalled again 0.47 and textext. , very sad cannot use the latest version 0.48 with textext. Although not an expert at python, I can add a few more comments that might help. When you run the textext extension in Inkscape there is a GUI window that opens in which you type your LaTeX markup. From what I've read, when writing Python code to create such a GUI there are a number of different GUI libraries that can be used. One is Tcl/Tk and another is GTK, and there are others too. If you look at the Python code in the textext.py file you'll see that the textext GUI can be rendered using either Tcl/Tk or GTK. The code is such that it first looks for the python GTK module, pygtk. (I assume it is looking in the C:\ program files\inkscape\python folder and subfolders.) If it can't find the GTK module then it will look for the Tcl/Tk module, tkinter. The original error message running textext 0.4.4 in Inkscape 0.48 is, "Neither pygtk nor Tkinter is available!". I assume it's not finding the necessary modules for either Tcl/Tk or GTK in the python folder installed by Inkscape 0.48. Now, there may be some other python modules that are also needed, such as this "lxml wrapper" referred to in your error message. I'm guessing that if a python distribution with all the needed modules in the correct subfolders is copied over the python folder that comes with Inkscape then textext will work. The trick is having all the necessary modules in your python distribution. However, I also have the Enthought Python distribution installed on my system. This includes basic python 2.6 and lots of other python packages. When I copied the entire distribution from c:\python26 over into c:\program files\inkscape\python I had success. Textext worked in Inkscape 0.48. Apparently, the Enthought python distribution has all the necessary modules. I'll add that textext ran with a Tcl/Tk GUI, not the GTK GUI. Since textext.py searches for GTK first, this means the Enthought python has Tcl/TK but not GTK. Someone who knows a bit more about all of this could tell us exactly which files/folders/packages/modules or whatever need to be present in the \inkscape\python folder. But this is all I have to offer. Hope it helps some. I had a same problem: "The fantastic lxml wrapper for libxml2 is required....."
copied python 2.6 over inkscape python. works!! thanks a lot. I have also copy my python 2.6 and then copy back the lxm like in the previous post. i am having the same problem as described 3 posts above. i've tried different python versions and so on. Plesae, does anybody has an idea how to fix the e.affect.... error? I've worked myselft through about 10 different errors today and want this thing to work already! Have exactly the same problem as in #8. My system: Windows 7 64 bit, Inkscape 0.4.8, python 2.6.6 installed in c:\python26 and copied to inkscape, miktex 2.9, pstoedit 3.50 installed and working, textext 0.4.4. I had all the problems described in this thread. Hope there is someone out there with the next solution! I hame problem than #8 with Windows 7 64bits. It's related to the 32/64 bits stuff, because this not happen with W7 32bits..
For Extensions -> Render -> LaTeX formula: Both TeXLive 2010 and MikTex 2.8 work. Install Inkscape 0.47, ghostscript 8.71, ghostview 4.9, pstoedit 3.50. For Extensions -> Tex Text: TeXLive does *NOT* work, only MikTex 2.8, probably and 2.9. Install Inkscape 0.47, ghostscript 8.71, ghostview 4.9, pstoedit 3.50, textext 0.4.4. TeXLive/MikTex, ghostscript, ghostview and pstoedit MUST be added to PATH, or nothing will work. This is response to the long comment around 10 comments above. Tested on desktop machine and two laptops, Windows XP SP3. Forgot something. If Extensions -> Render -> LaTeX formula gives an error, change TEMP and TMP variables to C:\Temp or something less than 8 letters, sometimes it gives an error (sometimes it works fine). Variables PATH, TEMP, TMP, etc are in Control Panel -> System -> Advanced -> Environment variables. If you want to set GTK (GIMP, Inkscape, etc) to a specific language, add a variable LANG and set it to C (ANSI - English) or some other language. All the information gathered within this thread was very valuable. Now everything works properly. 21, that also works for me! I have searched like 2 hours but it has finally paid out. I performed the instructions of Wiki macro error: User '#15' not found. (installing python 2.6, and pygtk, pyobject, and pycairo. + doing the copy operation). Then I followed the instructions on the following website. It worked all fine after these two fixes. I get no warnings. ---REPEATING PREVIOUS POST due to bad link--- I had the similar problem. My configuration was : Windows Vista Home Premium (64bit) Inkscape 0.48, pstoedit 3.5, textext 0.4.4. I performed the instructions of #15 (installing python 2.6, and pygtk, pyobject, and pycairo. + doing the copy operation). Then I followed the instructions on the following website. For Win 7, Inkscape 0.48 and textext 0.4.4 the following process worked for me (thanks to all previous contributions by various authors!). See web pages at end. Ensure that the PATH environment variable contains C:\Program Files\Inkscape\libxml2-2.7.7.win32;c:\program files\graphicsmagick-1.3.12-q8;C:\Program Files\MiKTeX 2.9\miktex\bin. for windows 7 64 bit computer, see the bottom of page at following link: http://en.wikiversity.org/wiki/User:Egm6341.s10.team3.heejun/Inkscape hope this helps someone else. tmp.tex -some-options-here' fails to create tmp.pdf. The solution is simply to modify textext.py to run pdflatex in the correct working directory. Basically I added one optional input variable to specify the current working directory when executing a command, so we change to the created temporary directory first then run pdflatex. And it still wouldn't recognize that I have the libmxl2. Not sure what to do now. Any help? If you get the "XMLSyntaxError: Document is empty, line 1, column 1" (like in comments #8 and #33 above) on Windows 7 64bit then this is most likely due to pstoedit not finding ghostscript. Most likely you have installed a 64bit version of ghostscript but pstoedit is searching for gswin32c (the 32bit version). You can check that by typing "pstoedit -gstest" into a cmd.exe window. If it throws up an error then this is probably the issue. De-install your 64bit ghostscript (and gsview if you have that) and replace them by the 32bit versions. Then run the "pstoedit -gstest" command again to check that it has fixed the error. Now textext should work (provided you have fixed the pygtk issue mentioned above). By the way: if you install only the basic pstoedit install then there is no need for graphicsmagick. Also, libxml2 is definitely not needed if you use the pygtk provided by David Gleich (see comment #15 above). In that case you also don't need the additional full python install and you don't need to copy lxml. The md5 deprecated warning is independent of all that and needs to be fixed by editing textext.py if it annoys you (see comment #8 above). But textext is still not working! Could you help me please? I forgot to say that I have installed pstoeditsetup350.exe. First I tried pstoeditsetup_x64.exe but it does not work for me. does anyone else have the similar problem? and how to solve it? I was having exactly the same problems and now all is running smooth!!! That is a stupid solution, that is like telling a linux user trying to instal Office 2007 through WINE they should just get Windows. I rather have someone tell me how to use WINE and not get all superior about their operating system. The main problem is that inkscape installs its own version of python. To work around this you need to make a hard link (linux style in windows) within the inscape directory pointing to your install of python. If you get any other module/import errors, just google the module, download and install to your default python directory. (if you are really lazy, just get pythonxy and set it to install everything and you will get every module out there). Thank you very much. I could completely solve the problem in using TexText with TexLive following the procedure addressed (#30). but still it doesn't work. what am i missing? It does not work on Inkscape V0.91, after following those steps mentioned above. There is still an error on "neither pygtk nor pytinker available". It may due to the fact that I am using Python 2.7 on my Win 7 computer. What is worse, when I tried to uninstall Inkscape and reinstall Inkscape 0.48 and then Textext 0.4.4, it always warning me an previous version of textext was installed and it cannot process to install the textext anymore! Notice that I have totally deleted the textext files in my directory, including the uninstall000.exe. What should I do? Thanks. For TexText to work on v0.91 use the version 0.5 from Pit Garbe. 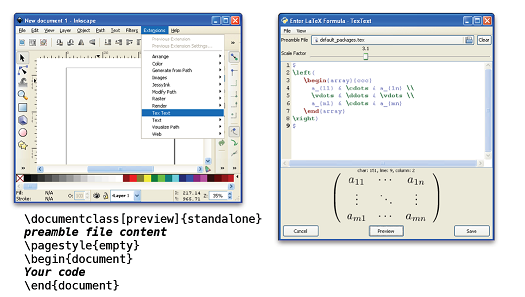 Then you have to updated the code of textext.py to handle the change introduced in Inkscape 0.91. This affects lines 299 and 300 of the source code. Then it works for inkscape 0.91, even 64 bit. I have followed the instrutions given here: https://bitbucket.org/pitgarbe/textext/overview#markdown-header-installation-for-windows As well as your instructions. I still have this error: "The fantastic lxml wrapper for libxml2 is required by inkex.py and therefore this extension. Please download and install the latest version from http://cheeseshop.python.org/pypi/lxml/, or install it through your package manager by a command like: sudo apt-get install python-lxml Technical details: No module named lxml"
I have downloaded and installed the lastest version (lxml-3.5.0.win-amd64-py2.7.exe (md5)) in the link provided. My python version is 2.7, but the error persist. I would appreciate if you can give me a hand. Thank you in advance! Hi Rubron, to help you I would need to know if you use a Python distribution like Anaconda or if you installed the bare Python and you are adding libraries to it? This should be fine, I don't expect problems with the path. Before I replaced Inkscape built-in python distribution with Anaconda I had library issue, but after it worked right away. Did you install lxml via Anaconda or did you add it via a separate installer? Is it an option for you to upgrade to inkscape 0.91 and use pitgarbe's textext 0.5? I just install inkscape 0.91 yesterday, and use pitgarbe's textext 0.5. I install lxml via a separate installer. I don't how to install it by using Anaconda ( I can search it if that is the issue). This may be the issue, if I'm not wrong you can install packages from the command line using conda. Hi Vladi, now it works, the problem was that inkscape/python was not linked correctly with Anaconda directory. Once I correct it, it works perfectly! (I just used C:\Users\myname\Anaconda\ instead of C:\Users\myname\Anaconda) Many thanks for your time Vladislav! That's great, you are welcome! Hi again Vladislav, one more question, since you use anaconda's python instead of pygtk package, I guess that the nice GUI for TexText given by "PyGTKSourceView2 2.10.1" won't be available. Am I right? If so, there is a way to enable it? Thank you. Hi! I don't know how the GUI with PyGTKSourceView2 would look like because I didn't use TexText before. The GUI that I have lacks a preview of the latex that I type, maybe this would appear? You may try to install PyGTKSourceView2 in Anaconda using the conda installer, if someone prepared this package in the anaconda repository. I'm sorry that I cannot help you more than this. maybe someone can help me to get textext to run.... Installed x64 - inkscape 0.91, textext 0.5, anaconda for python. I followed the description to get it run but inscape reported an error in the textext.py script.
" File "textext.py", line 111 filtered_messages = filter(lambda (m, l): l != LOG_LEVEL_DEBUG, filtered_messages) ^ SyntaxError: invalid syntax "
Would be very kind of you to help me with this issue! I think I figured out the problem! It seems to be that python3.5 (3.5.1) produce the syntax error. I had not only problem with textext but also with importing eps figueres. After I used python2.7.11 (Anaconda 2.5.0) with inkscape textext and eps imports works fine.